Few 2013 movies received as much hype as the Will Ferrell comedy “Anchorman 2: The Legend Continues.” The media attention was the result of several factors, not the least of which was the impressive performance of the original “Anchorman: The Legend of Ron Burgundy.” That film grossed about $85 million in the U.S., winning fans with its goofy-yet-perceptive portrayal of TV journalists working during the mid-1970s. “Anchor Man 2” ratchets up the silliness, moving the characters several years forward to the advent of 24-hour cable news channels. As the movie begins, former San Diego news anchor Ron Burgundy (Ferrell) is co-hosting a New York program with his now-wife Veronica Corningstone (Christina Applegate). Their seemingly sound relationship breaks down when Veronica is offered a slot on the coveted evening news and Ron is simultaneously fired. Broken and dejected, Ron leaves Veronica and returns to San Diego where his self-destructive behavior makes it impossible for him to hold a job. Just when things look most dire, the advent of 24-hour cable news comes to the rescue. An executive from the newly forming Global News Network offers Ron an anchor slot and gives him the OK to hire anyone he likes. Without hesitation, Ron adds former sportscaster Champ Kind (David Koechner), former weatherman Brick Tamland (Steve Carrell) and ace reporter Brian Fantana (Paul Rudd). Reunited, the group heads to New York with dreams of re-establishing their glory days. Like its inspiration, “Anchorman 2” is a big, broad comedy that banks on preposterous situations in a quest for laughs. Sometimes it succeeds. Because of the talented cast and because the movie has at least a minor interest in media criticism, there are laugh-out-loud moments. Sadly, these are inconsistent and spaced so poorly that much of “Anchorman 2” is a drag. In the first movie, director and co-writer Adam McKay established that it could be funny to watch grown men act like imbeciles. With the sequel, he overdoes it. During the course of the film, Ron goes on a drunken rant in front of an amusement park audience, offends a black family by making racist comments in an attempt to “assimilate” himself and, once again, engages in a brutal brawl with other TV personalities. If this sounds like great fun, “Anchorman 2” is your movie. Viewers who prefer humor tinged with subtlety and wit, should look elsewhere. “Anchorman 2” is at its best when critiquing cable news practices, such as the nonstop speculation that accompanies virtually any breaking news item. Unfortunately, such moments are a small part of the two-hour run time. The DVD release features no extras. The Blu-ray combo pack has many extras, including multiple versions of the film, an audio commentary, a gag reel and behind-the-scenes featurettes. Despite bringing in nearly $150 million worldwide, “47 Ronin” is regarded as one of 2013’s biggest flops, in large part because the movie cost a fortune to make. In late December, Variety put the production budget at $175 million, and that number doesn’t include marketing. That means the film didn’t come close to breaking even, despite pulling decent numbers internationally. The movie also suffered deservedly poor reviews, and it doesn’t play any better on the small screen. The plot is based on the true story of 47 samurai who sought revenge for the death of their master at the beginning of the 18th century. In Japan, the tale has become the stuff of legend, with many fictionalized accounts created over the decades. This latest incarnation has little basis in reality, as director Carl Rinsch and his team of screenwriters opted for a fantasy tale complete with fanciful beasts, black magic and a decidedly Western protagonist. 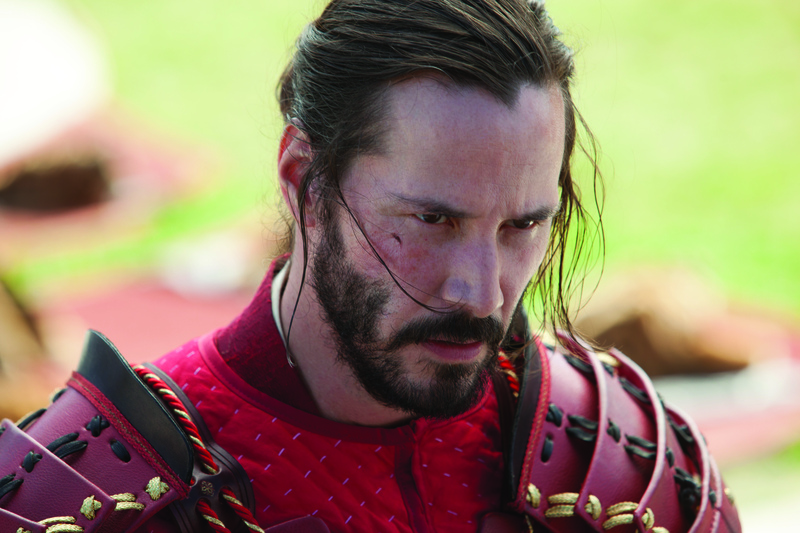 Keanu Reeves stars as Kai, a half-British, half-Japanese boy who is taken in by the kindly Lord Asano (Min Tanaka). Kai immediately falls in love with Asano’s daughter, Mika (Ko Shibasaki), and she with him, but their relationship is culturally forbidden. When lord Asano is bewitched and subsequently shamed by a scheming lord named Kira, he is forced to commit ritual suicide, leaving all of his samurai and Kai without a master. Several years later, Kai and the remaining samurai attack Kira’s forces in hopes of revenge. Rinsch does a fine job with the battle sequences, which are well choreographed and visually impressive. Those who watch the film in Blu-ray 3D will appreciate this even more because the project was designed for 3D rather than converted afterward. Alas, the storytelling doesn’t keep pace with the visuals. Kai’s part in the movie stands out as a deliberate and weak attempt to Westernize an Asian story, and the movie’s pace is plodding and dull despite frequent combat breaks. Furthermore, the fantasy elements are unnecessary. The inclusion of monsters and witches allows for enhanced special effects but does nothing to improve the dramatic arc or pacing. DVD and Blu-ray extras include a making-of feature and deleted scenes. “The Pirate Fairy”: Direct-to-video animated movie from Disney. The story centers on Zarina, a fairy who leaves Pixie Hollow and becomes captain of a crew of dangerous pirates. This leaves Tinkerbell and her fairy friends to face off against the pirates, including a young version of Captain Hook. “The Bag Man”: Thriller starring John Cusack as a low-level criminal charged with delivering a package for his boss (Robert DeNiro). The trouble is he can’t open the package or ask any questions, and everyone he meets wants a piece of it. Rebecca Da Costa and Crispin Glover also star. Directed and co-written by David Grovic. “The Little Rascals Save the Day”: New movie based on the characters made famous by the classic Our Gang comedies. The story follows Spanky, Alfalfa, Darla and Buckwheat as they try to make money to save their grandmother’s (Doris Roberts) bakery. “The Dean Martin Celebrity Roasts”: Six-disc collection of 17 celebrity roasts aimed at famous figures ranging from Betty White and Ronald Reagan to Muhammad Ali and Ralph Nader.